Freshman right-side/setter Kelly Murphy recorded her eighth consecutive double-double and the Florida defense found its rhythm Wednesday as the No. 8/7 Gators swept South Carolina, 3-0 (25-22, 25-17, 25-15) in the Stephen C. O’Connell Center. Florida (15-1, 9-0 SEC) out-dug South Carolina (14-4, 6-3), which entered the match as the league’s top defensive team, 42-38 and out-blocked the Gamecocks 8.0-2.0. The Gators also out-hit South Carolina .381-.186. 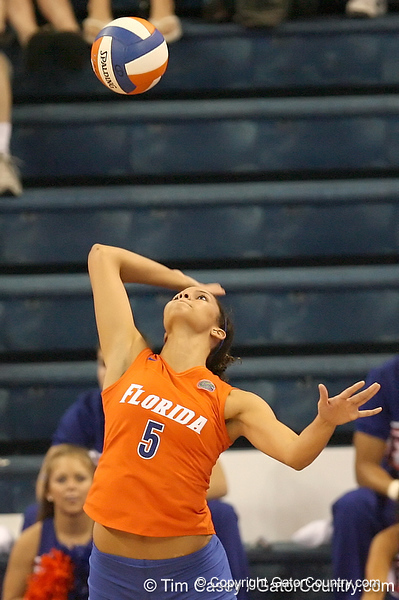 Murphy had 13 kills on .522 hitting with a match-high 22 assists to lead the Gators. Freshman outside hitter Colleen Ward finished with 10 kills on .409 hitting with six digs and a career-high five blocks. Ward also finished with a match-high 14.5 points. Senior middle blocker Kelsey Bowers tied her season high with eight kills on a season-best .636 hitting, while freshman middle blocker Cassandra Anderson concluded the match with a career-high five blocks and three kills. Junior libero Elyse Cusack finished with a team-high 10 digs to increase her career digs total to 1,368 scoops. She needs just four more to tie Rachel Engel for third place all-time. Sophomore outside hitter Callie Rivers registered nine kills on .350 hitting with nine digs, while freshman setter Cindy Bathelt finished with 21 assists and seven digs. Florida returns to action on Friday when it travels to Auburn, Ala., to face the Tigers. Opening serve is set for 7 p.m. EDT and the match will be carried live on WRUF AM-850 with Tom Collett. Florida sophomore outside hitter Callie Rivers serves during the Gators' sweep of the South Carolina Gamecock on Wednesday, October 15, 2008 at the Stephen C. O'Connell Center in Gainesville, Fla.